Buzz lets you create various activity types using the same tool. 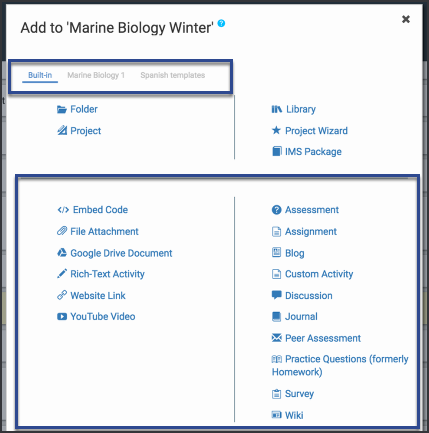 Buzz provides activity types to facilitate quick creation of a variety of activities that support personalized and project-based learning models. You can create Wikis and Discussion threads to promote collaborative knowledge creation and idea exchange, Journals and Blogs for personal reflection, as well as more traditional assignments and assessments. Use the tabs along the top to add activities from other courses as Activity Templates(your system admin must add Activity Templates for tabs to appear). Click the activity type you want to add and provide the information that Buzz prompts you to include for the chosen activity type.